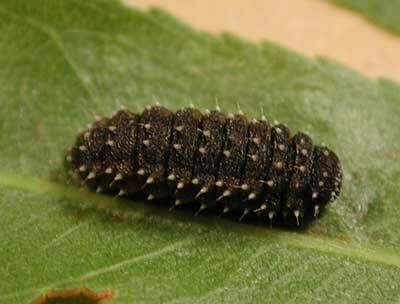 The lower image is the larval form - (caterpillar) - it was found feeding on leaves of Goodding's Willow (Salix gooddingii) at Hassayampa Box Canyon on 26 April 2008. On maturity the larva tunneled into moist sand for pupation and emerged as the adult (top photo) approx. 3 weeks later. These colorful, active and wary beetles are commonly found on Goodding's Willow in the Sonoran Desert and thus are similarly restricted to riparian habitats. 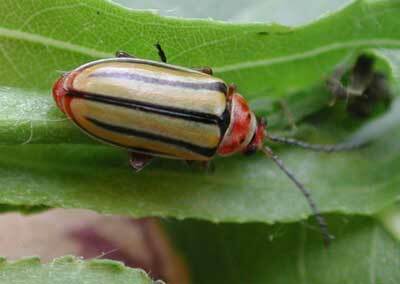 Although there are other, similar species of striped flea beetles, this species only feeds on willows. This species is widely distributed across North America. Flea beetles have strong, enlarged hind legs that are built for jumping - they'll launch away if closely approached. There are many species of flea beetles - many are colorful, but most are smaller than this one. Some are important pests of food crops.